Bam Cello Cases , call for price. 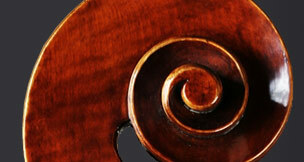 We now offer BAM Cello cases. BAM enjoys a very reliable reputation for excellence and French fashion! Anyone that went to the most recent NAMM (musical instrument trade show), would have seen the people lining up to get a photograph next to their 'Cow Case'! 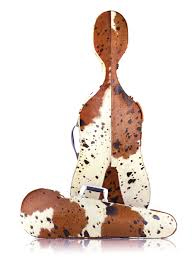 Yes, that's real cowhide and they call it their "Texas" line! This one is not popular with the animal rights activist/cellists. Eeeeha! Sorry, don't normally stock these, but if you want to order one, we could certainly do that for you. 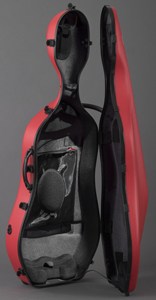 The Classic cello case, with wheels, is their most affordable cello case. It is a sporty looking case (with wheels) and average weight around 13 lbs. The Classic is made with ABS plastic and is very popular. The normal advertized price for these is $724, but please call for our special sale price, 800-600-2689 (480-785-5491) Free Shipping on the BAM cello cases. Here are photos of the new, BAM Classic Cello Case, with Wheels. We have this red color available and also grey, but if there is another color choice that you prefer, we can certainly order it.